When I think haddock I think fish and chips. It peaks in winter/early spring, when greasy fried fish are probably most desired. Or a creamy fish pie, some humble fishcakes or a fragrant kedgeree. It feels very quintessentially British, and almost... boring, sorry. It's because in my mind I'd ever only associated it with those dishes. 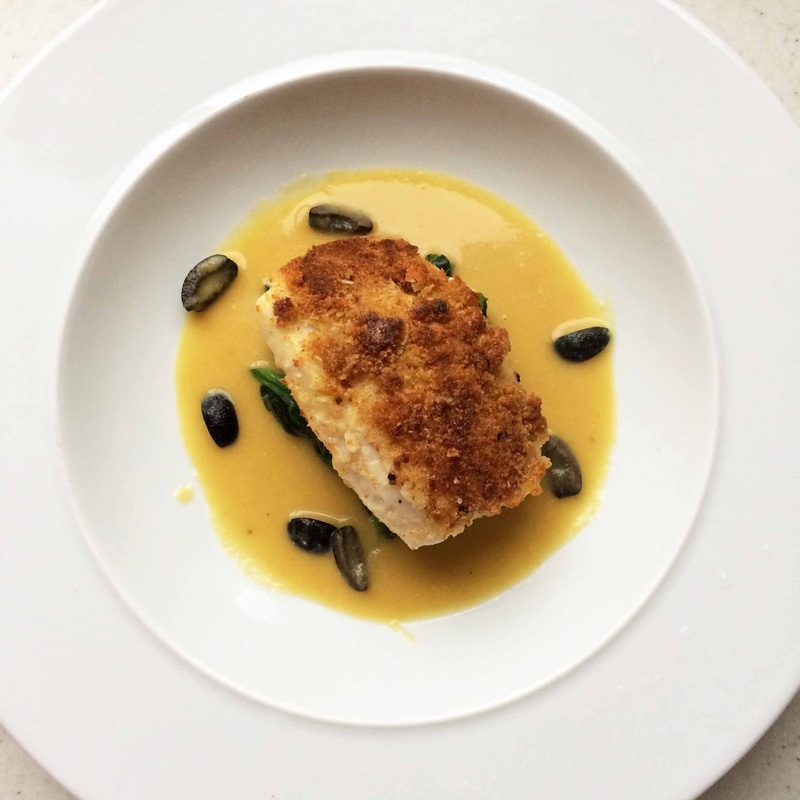 Haddock has always sounded perfectly nice, but it's not like the popular boy in school. So this is why I've come to cook some haddock fillets. 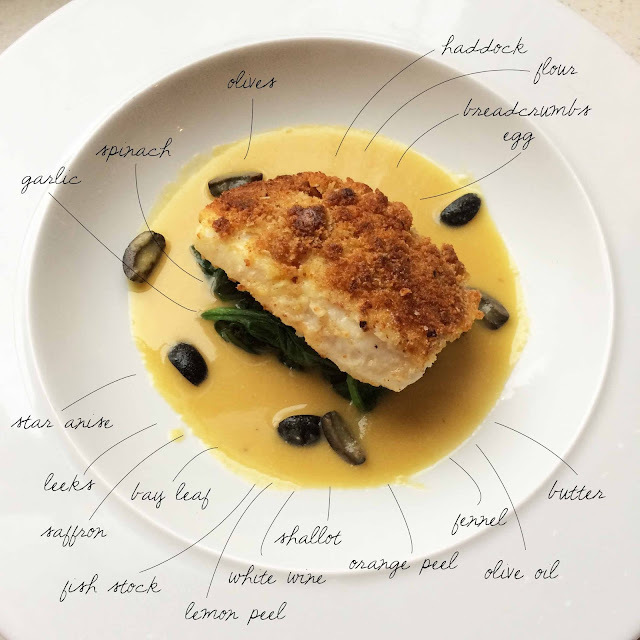 Loaf, an interactive recipe app featuring food bloggers, and the Marine Stewardship Council have teamed up to educate the world about sustainable fish. And here I am, among other food bloggers, giving you ideas to play around with when it comes to fish like haddock. It doesn't have to be fishcakes. Here I've made a nice saffron sauce (a bit cumbersome but well worth the effort), coated it in crispy breadcrumbs and topped on some spinach just to add some greens. Begin with the sauce. Fry the fennel, shallot and leeks in olive oil over gentle heat without coloring until softened, about 5 minutes. Add the bay leaf, star anise, orange and lemon peel, and the saffron water. Cook for a further two minutes. Add a generous splash of white wine, turn up the heat to medium high and let that reduce down to almost dry, then add the fish stock. Bring to boil and simmer for five minutes. Remove the peels, bay leaf and star anise, and put in a blender. Blitz in a few short bursts. Pass through a fine sieve and set aside. Fry the garlic in a bit of olive oil without coloring, just until softened, a few minutes. Then turn up the heat to high and add the spinach, cook and turn until wilted. Pat the fish dry and season generously with salt and pepper. Dip the skin side down (the presentation side) in the flour, then the egg, then the breadcrumbs. Repeat the last two steps. Add enough oil to coat the base of a pan. Turn the heat to medium and when the oil is hot, gently put the fish down, breadcrumb side down. Let the fish bubble away in the oil for a few minutes, then use a soft spatula to lift to see if the crumbs are golden brown - when they are, flip over and cook for two more minutes.